This professional Bi-Xenon Harley Davidson HID kit will completely replace your factory lighting to our HID lighting. This kit will enable you to have HID's for your LO and HI beams. Our Harley H.I.D. Kit is custom designed for Harley Davidson motorcycles, including everything needed for a smooth Plug ‘N Play installation. See 3x brighter and seriously improve your RIDE at night! Considering LEDs? Forget it, HIDs are much brighter and project a further and wider beam at a fraction of the cost compared to LEDs that can cost upwards of $500 or more. Fitment: Road Kings, Soft tails, Electra Glides, Street Glides, Dyna Glides, Fat Boy. Please Note: Will fit any Harley motorcycle that does not use a sealed beam. As long as the bulb is replaceable, this H.I.D. kit should work. A professional TruHids® Bi-Xenon direct connect cables. Industrial strength double sided 3M pad. Road tested by actual Harley owners. H.I.Ds outlasts traditional halogens lifespan by 3x or more. interstate’s overhead signs, allowing you to see them like never before. offering a much better value. dramatically improving night vision driving. See DEER at a greater distance than ever before. What is the difference with your HID kits? Our HID kits were designed and tested to give you the best performance, compatibility, and value for your purchase. Our kits are completely designed to be Plug N Play - No modding, wire cutting/stripping necessary. This means you will not void your warranty when using/installing our kit. We use only high quality components in our ballasts and they are one of the smallest, lightest and most rugged ballasts available. Completely weatherproof and ready for action. NOT all bulbs and ballasts are the same. The quality of IC components used in the ballasts plays a big role with performance and reliability. With over 4 years of product development and testing with actual Honda Gold Wing and Harley owner's, our kit is one of the most favored kits available. Our Bi-Xenon bulb has a solenoid that moves the bulb up and down using the supplied Bi-Xenon cables. This means you get HIDs for your HI and LO beams, unlike cheap kits that give you a halogen high beam output. Our kits are all 100% Plug N Play so installation is painless and there are no modifications or wire stripping necessary, leaving your manufacturer warranty intact. The stock bulbs on your motorcycle do not provide enough lighting for you to ride in the evening. Once you go with one of our lighting Plug N Play kits, you will never go back. 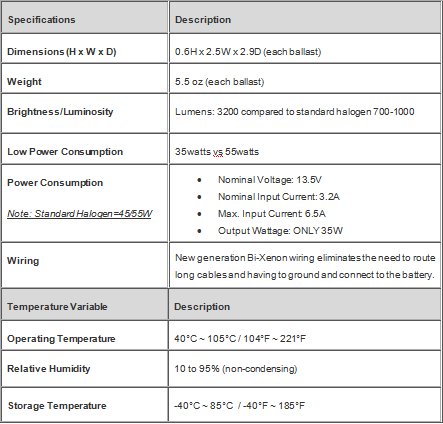 See a comparison of our Bi-Xenon bulb next to the competitor's bulb below. 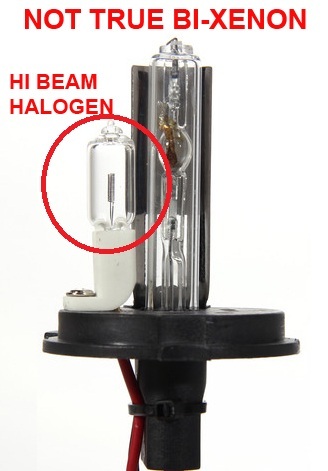 Unlike other cheap kits that claim to use Bi-Xenon technology (as shown below), they use a small halogen bulb for the HI beam. 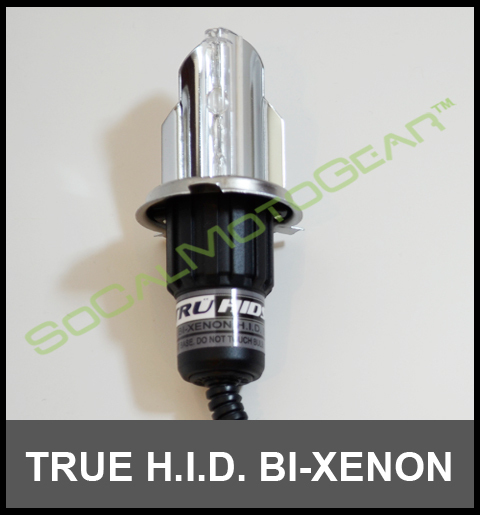 Our Bi-Xenon bulbs have a solenoid that controls the light up and down giving you a true H.I.D. high beam output.